Clear skies overnight – Orion and a bit of moon were overhead when I started to open. Not much activity along the edges. But later, when the sun was just up, American Robins began to drop out of the sky, looking for a place to spend the day – to feed and rest. Banded 90: 1 MODO, 1 HAWO, 1 BRCR, 2 GCKI, 14 RCKI, 8 HETH, 7 CEDW, 14 MYWA, 1 FOSP, 6 SOSP, 1 SWSP, 9 WTSP, 1 EWCS, 2 SCJU, 22 AMGO. Retrapped 18: 1 MODO. 1 BCCH, 3 RCKI, 4 HETH, 1 MYWA, 4 SOSP, 2 WTSP, 2 AMGO. A cool start to the day although the winds have dropped off a bit but still a little breezy and cutting until the sun got warming things up. Of note a Green Heron did a fly by twice at the tip. Monarch Butterflies and Dragon flys are still migrating. A steady assortment of birds in the trees and a few raptors migrating over. Several flocks of EABL were noted going overalong with other diurnal migrants. Windy and cold from the getgo and almost no call notes from the wood margins as I was opening…so I wasn’t expecting much. So I was quite surprised when birds started to fill up the billowing nets. 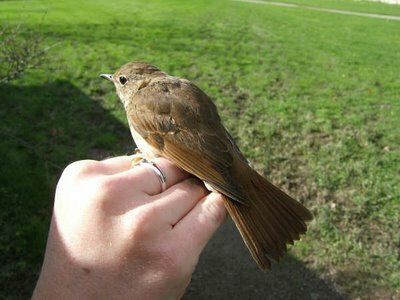 I was also pleased as this was “public demonstration” day and we had some visitors – that got their fill of bird banding. Between the three of us (Loretta, Brian and myself) we were able to give all of them a “banding experience”. 18 MYWA, 1 CHSP, 5 SOSP, 1 SWSP, 15 WTSP, 2 EWCS, 7 SCJU, 1 HOFI, 11 AMGO. Retrapped 16: 1 DOWO, 2 BCCH, 1 RCKI, 1 EABL (this was a male, banded as a hatchiling in a Ruthven nestbox in 2004), 1 HETH, 1 NOCA, 5 WTSP, 1 SCJU, 1 HOFI, 2 AMGO. The wimd was keeping the birds low. At one point we had 14 MYWA’s in net #6 – all but one of them was in the bottom panel. An immature Bald Eagle entertained the visitors in mid-morning. 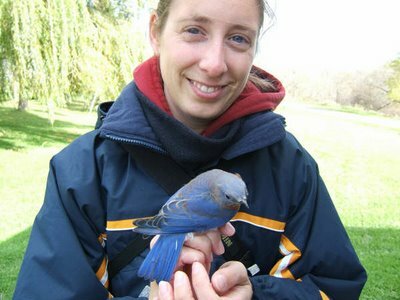 Faye Socholotiuk with a nice Eastern Bluebird. 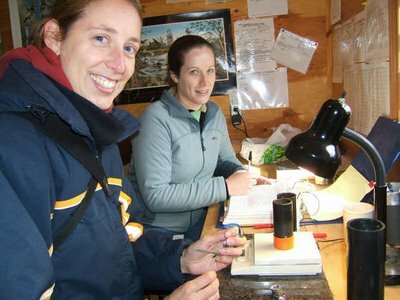 Faye Socholotiuk and Leanne Jennings processing a Brown Creeper. 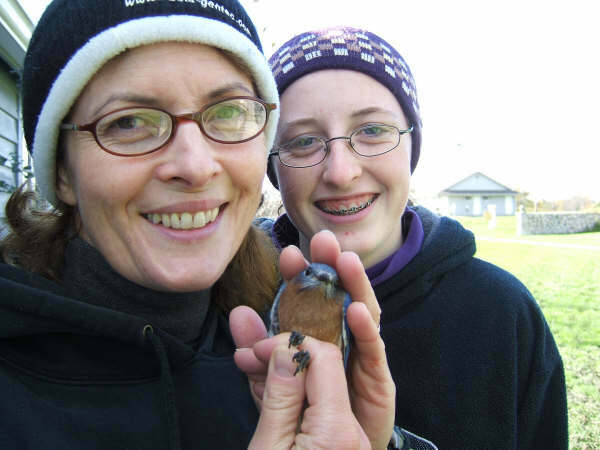 Elaine and Christine Otterman with an Eastern Bluebird. 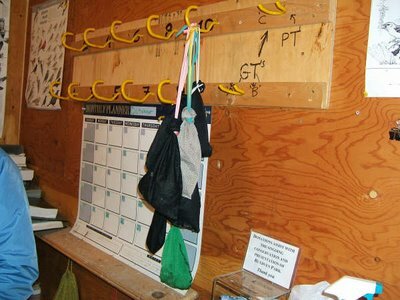 At Ruthven, this is where birds wait to be processed after being trapped and extracted. Apparently net #10 was popular on the 14th. A much calmer day than yesterday but still a cool raw day especially from mid morning unwards as the wind picked up but the sun was nice. Of note a DCCO of all silly things was on the long foot bridge when I can in this morning and walked off the bridge in front of me in the tractor head lights before disappearing into the brush. When leaving the bird was back by the foot bridge in the marsh grasses where we caught it and released it in Spring Creek where it swam away. 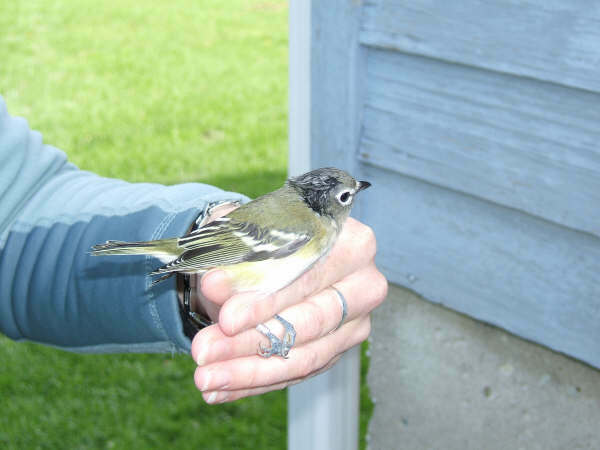 I suspect the bird was sick or we would have banded it. Neat blue/green eyes this bird had. A breezy day with a skif of snow on the ground at dawn. Not too far east of the Park apparently they got socked with snow. We had snow showers, small hail showers and rain showers on and off. However by about 10:30 am the winds were getting pretty strong and with forecast to reach 90 km (55mi.) we packed it in early but it took 2 1/2 hours to close with the 10,000 leaves that blew in. Even with the weather codition less than ideal we managed to have a half decent day. Selkirk has now gone over 2400 birds banded this fall.